Inspired by the flavours of Asia, this dish will please just about anyone. Bring a pot of salted water to boil, add the potato and cook for 10 minutes or until cooked through. Drain and set aside. Combine the coriander, spring onion, garlic, half the soy sauce, and the vinegar in a large bowl and toss to combine. Gently fold through the potatoes with the shallot and black sesame seed mix. Heat some oil in a pan to medium-high temperature. Brush the barramundi with half of the soy sauce. Place the fish into the pan, jiggle the pan a little so that the fish isn’t sticking and cook for 3-4 minutes, turn and cook for a further 1-2 minutes until cooked through. 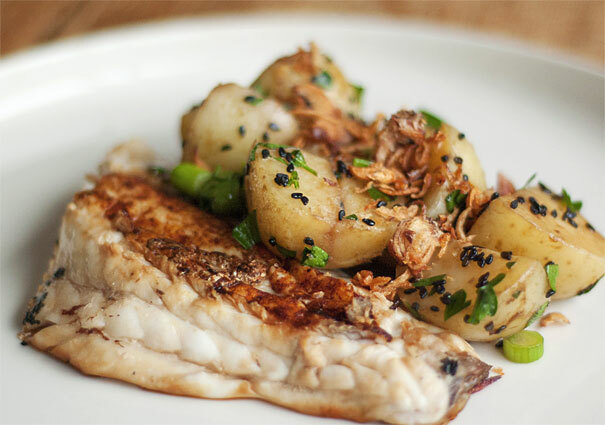 Serve the fish with a side of the asian potato salad.